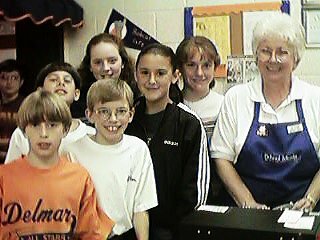 Kay Bozman stands at the cafeteria cash register each day at Delmar and greets every student with a smile as they pass through with their food trays. Last week she gave me the e-mail address of her son, Chip, who is stationed at Tuzla Air Base in Bosnia. Delmar students sent mail to Chip within the hour and replies came back the same day. Excitement is high at Delmar. Now the students write daily to our friend and Delmar family member across the seas. Thank you for the e-mail. It was a nice surprise. I've received letters from students in Wisconsin, Florida, and California. However, it is nice to hear from my old elementary school. I'm at Tuzla Air Base, Bosnia serving in Operation Joint Gaurd. I'm deployed with the US Air Force. My home base is Dover, Delaware. In Bosnia I serve as the Chief of Supply. We support airlift missions into this theatre of operations. We provide logistics support for the entire stabilization force. I serve with military from the US, Canada, Great Britain, Russia, Switzerland, Norway, Sweden, France, Germany, Finland, and many other nations. It is very interesting. Bosnia is a mountainous country. It is very pretty. It snowed earlier this week. It is very cold now and it rains frequently. My boots are always muddy. Most of the Bosnian people are happy we are here. There are a lot of Muslim people around Tuzla. They suffered greatly during the war. I flew over the country in a blackhawk helicopter and saw much destruction caused by the civil war. Our group sponsors the Simin Han orphanage. I went there about two weeks ago. We took the children toys, clothes, food, and candy. They were really happy to see us. It is so sad to think of what they have been through in their short lives. Most of their families were killed during the war. We are so fortunate to live in such a peaceful country. I guess our presence in this country really does make a difference. Thank you for thinking of me. I'd enjoy receiving e-mail from your students. If they have any questions I'd be happy to answer them. My name is Lauren. I'm from Salisbury, MD. I'm in 6th grade. On the email letter that you sent, you said that you were the Chief of Supply in Bosnia. What did you do? You also said that you where the Operation Joint Guard at the Tulsa air base. What did you do? In your letter you also said that it rained frequently. It has been raining a lot here. I think it is nice of you to think of all those little children. I would had done it too! Well it was nice writing to you! When you write back (if you can) please tell me the latest of what is happening in Bosnia!!!! Thanks for the message. As I said earlier I am the Chief of supply. 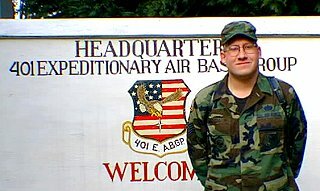 My unit is responsible for all the supply needs of the entire air force in Bosnia. Our primary mission is airlift of supplies and troops into the country. We requisition over $4,000,000 worth of supplies a year and manage an equipment account worth over $10,000,000. Operation Joint Gaurd is the name of the mission in Bosnia. Along with the army, navy, marines, and forces from other countries we attempt to keep the peace in this country that has been experiencing a civil war. It is fairly peaceful right now. The biggest danger is land mines. We are very careful of that. The army does a good job of ensuring that the people do not riot or fight. I really enjoyed going to the orphanage. It made me feel good to help other people, especially children. I have a five year old daughter and I hate to see children suffer. Thanks again for writing. Feel free to e-mail me anytime. My name is Todd. I am in sixth grade. What's it like in Bosnia? What kind of money do you have in Bosnia? Every thing is fine in Delmar. I am eleven. Halloween is coming tomorrow. Has anyone tried to damage your base? Is it fun to be in Bosnia? How long did it take you to get to Bosnia? Are you trying to get the Montgomery G.I. bill? I have to go now write back to me soon. Thank you for writing. On base we use American money. The country use Duetch marks for their money. I haven't been off base to spend money yet. There has been no damage to the base since I've been here. During the war there was heavy fighting here. Many of the buildings are destroyed. You can see damage on our air traffic control tower where it was strafed and shot at during the war. We have also cleared a lot of mine fields around the base. I do not have the Montgomery GI bill. That wasn't available to me when I came in the air force. I use a different program called tuition assistance. The Montgomery GI bill is a good program if you ever join the military. You should study hard in school and get good grades. If you can, after high school go to college. If you're interested in the military, get your college education first and join as an officer. Write again if you get a chance. I enjoyed your letter.